Keep your hair clean and healthy with the Selsun Blue Itchy Dry Scalp Naturals Dandruff Shampoo. It is enriched with moisturizers and Vitamins B5 and E to help control dandruff and re-hydrate your hair. This Selsun Blue shampoo comes in an 11 Oz bottle and features HYDRASEL targeted moisturizing formula for optimal results. It is ideal for use on dry and itchy scalp. 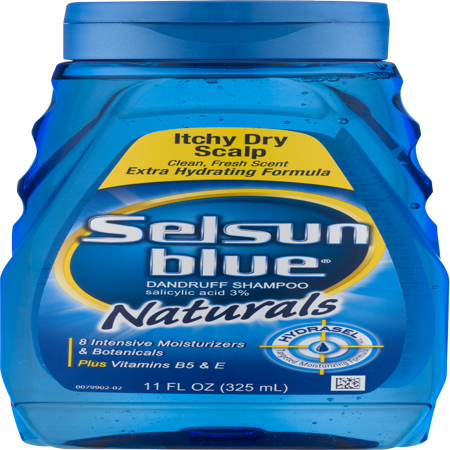 This Selsun Blue Itchy Dry Scalp Naturals Dandruff Shampoo features a clean and fresh scent. Ingredients: Active Ingredients: Salicylic Acid (3%). Purpose: Anti-Dandruff. 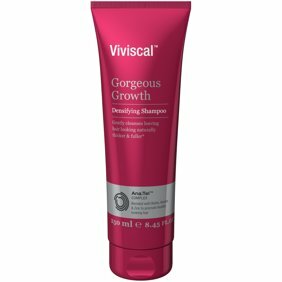 Inactive Ingredients: Water, Ammonium Laureth Sulfate, Ammonium Lauryl Sulfate, Sodium Methyl Cocoyl Taurate, Cocamidopropyl Betaine, PEG-10 Sunflower Glycerides, Fragrance, Cocodimonium Hydroxypropyl Hydrolyzed Rice Protein, Chamomilla Recutita (Matricaria) Flower Extract, Lavandula Angustifolia (Lavender) Extract, Rosmarinus Officinalis (Rosemary) Leaf Extract, Acacia Farnesiana Flower Extract, Tocopheryl Acetate, Aloe Barbadensis Leaf Juice, Panthenol, Cocamide MEA, Sodium Lauryl Glucose Carboxylate, Benzyl Alcohol, Lauryl Glucoside, Polyquaternium-67, Linoleamidopropyl PG-Dimonium Chloride Phosphate, Potassium Hydroxide, Citric Acid, Disodium EDTA, Benzophoenone-4, Isopropyl Myristate. Instructions: Directions: Shampoo, then rinse thoroughly. For best results, use at least twice a week or as directed by a doctor. Shampoo has nice smell and works great for reliving dandruff itch and flakes but you must continue to use it every 3 days or so if you want it to stay that way. Good price. my son has ezcema and it takes away the itching from his head. My scalp is very itchy and sometimes it continues to itch after I shampoo. I don't find that the case when I use this shampoo. I also love the smell, but most important it gets the job done. Worked very well for me and my daughter after the first use. Scalp immediately stopped itching, Hair did not feel dried out after using and the scent is ok not strong which is great. Will continue to use this product.